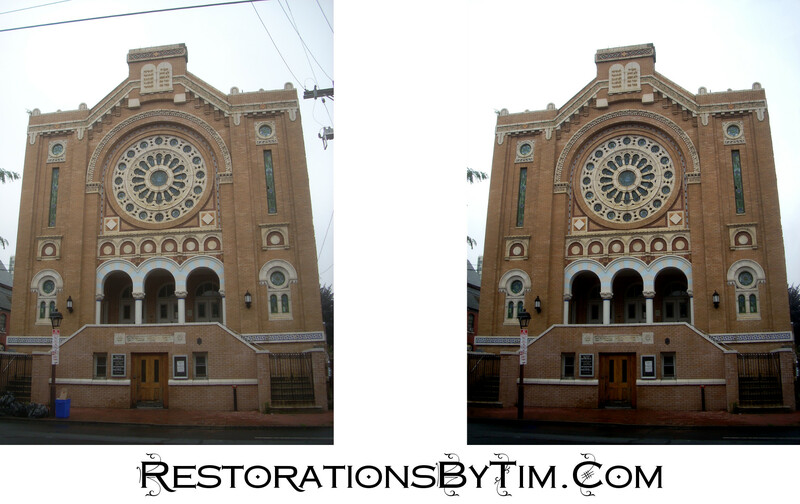 Moderate Alteration: Removing Small Distractions | Photo Restorations by Tim G.
I enjoy restoring damaged, worn, and faded photographs to their original splendor most of all, but I have other tricks up my sleeve. If some unwanted objects are spoiling the ambiance of your treasured memories, I can often wipe them out of the picture. Here is the B’nai Abraham Synagogue of Philadelphia. Bernard Levinathal, Rabbi of the B’nai Abraham, officiated the marriage of my great-grandparents in 1909. Removing the power lines from the clear blue sky was relatively straightforward. Removing the garbage bags from the front left took a little more work. Lastly, I tweaked the contrast to bring out the colors.